Many Pagans in the Twin Cities are have seen the film Agora, now available on DVD, and have remarked on how important this film is for our community. It is a powerful film. It is the story of immense loss, and injustice, and the passing of an age. A strongly woven tale and believable characters give it appeal to a wide audience … I got responses; “Powerful”, “Intense”, ” Like I imagined it”. I’d give it an eight. Very sad, and emotionally difficult to experience as a Pagan, but a film Pagans need to support and see. For a review and synopsis of the film, go here. The story of Hypatia, her life and the “passing of the age” of Paganism and classical science and literature, is one that should be told within our community. Yet the movie is not appropriate for young children. Which is why I was extremely excited to hear about a Picture Book that covers much of Hypatia’s unusual life. 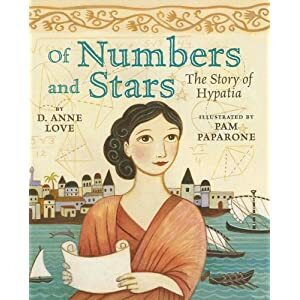 Of Numbers and Stars: The Story of Hypatia by Pam Paparone was published in 2006, but is getting renewed interest due to the success of Agora. This book would be a wonderful addition to any Pagan parents’ book shelves. The death of Hypatia at the hands of a Christian mob is only touched on by a footnote, so parents do not need to worry that the book would be too violent for their children. Not only does it reinforce to children that in Paganism faith and science are not mutually exclusive, it gives young girls a strong and positive role model. The artwork is a pleasing blend of Greek and Egyptian, just as Alexandria was while Hypatia was alive. Thank you for this tid bit of info…good to know about children’s resources.